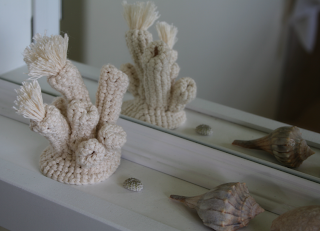 It's been awhile since I've knitted, crocheted or even crafted anything for that matter, so I was extremely anxious to get started on a new set of Wunderkammer crocheted sea creature patterns by Jessica Polk. I got the patterns (and you can get yours there too) at The Curiosity Shoppe. Here is my version of the blooming coral which now resides in our new bathroom. I think it looks pretty much like the real thing. Next up is the coral branch. stay tuned. I'm looking forward to seeing your coral, and making some of these pieces myself. So far, I've only made a sand dollar. Can't seem to stop with the sock knitting. You probably don't have much need for wool socks there on the island, eh? i can't get over how perfect that is! and it fits in so well with all your decor. nice job! !